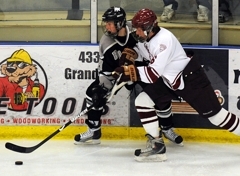 Duluth Central played its first regular season game in history under the school's new configuration on Saturday, Nov. 27 at the Duluth Heritage Center against Roseville. 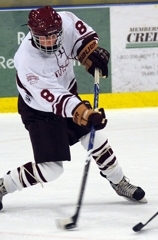 Central, sporting its new white and burgundy jerseys with a Trojans patch on on shoulder and Hunters on the other to represent the merger of Central and Denfled high schools, started the season with a 4-1 loss. It’s early in the season and despite the loss, Central coach Kevin Smalley was content with his team’s progress. “We’re getting better, we’re taking baby steps,” Smalley said. “But in the first and second periods we didn’t get enough pucks to the net. We failed to take shots that we should have taken." Through two periods, the shots were 19-9 in favor of Roseville. Central took only four shots in the first period. Four of Roseville’s shots came in one flurry with less than 30 seconds left in the period. “It’s early obviously, but to me it’s not too early to understand when to shoot the puck,” Smalley said. “I think we played into their hand quite a bit, and we let their defensemen push us into the corners." Roseville scored just 26 seconds into the second period on a shot from Spencer Sand. 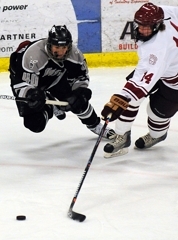 Connor Brausen gave the Raiders a 2-0 lead less than four minutes later. With the Trojans' Colin Magnuson in the box for slashing Roseville goaltender Brian Comiskey, Brausen flipped a shot past Central sophomore goaltender Zach Thompson just 12 seconds into the power play. Down that same score, Central controlled most of the third period as Roseville appeared to run out of gas at the end of its busy weekend. 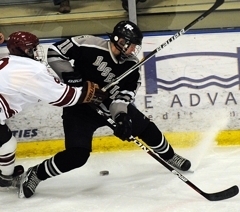 But the Raiders recovered to take a 3-0 lead on an unassisted Jake McCann goal. 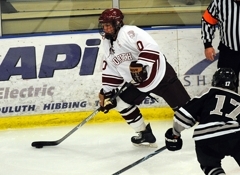 Central continued its strong play and brought the deficit back to two goals on Alec Lofdahl's first goal of the season. After just nine shots on net through two periods, Central poured 13 third-period shots at Comiskey. 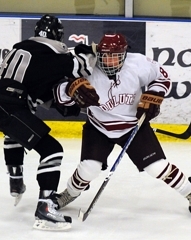 “In the third period it was evident that we put everything to the net,” Smalley said. “I think the tides were changing, and we got them on their heels and we could have scored another goal when it was 3-1." The final shots on goal were 25-22 in favor of Roseville. The Trojans put up 13 shots in the third period alone, which was more than both the first two periods combined. The Raiders only put up three shots in the final period of play, although two of them were goals, including an empty netter from Brausen to close out the scoring. “I think the kids are gradually starting to figure out what we need to do and where they need to be at on the rink,” Smalley said. “It’s a three period game, and I don’t think we came here with three periods today." Smalley said the Trojans will work on positioning and conditioning, but what he wants to see most is confidence in his players. Smalley understands the caliber of Roseville and does not want his team to take the loss too hard. “We played a good team today. They had 17 returning letterwinners from last year,” Smalley said. “They took their licks last year and you can tell how much they’ve improved and how strong they got on the puck and they got a lot better obviously." It’s almost unheard of for any team to return that many players, but Roseville used its experience to advantage with a two-game sweep in its northern trip (including a 3-0 victory at Virginia/Mt. Iron-Buhl Friday night). Up next for Roseville is a home game against Woodbury at 7:30 p.m. on Saturday, Dec. 4 while Duluth Central will be back at the Duluth Heritage Center to take on Ashland (Wis.) at 5:30 p.m. on Tuesday, Nov. 30. 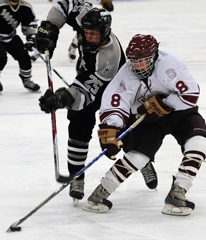 Roseville hockey coach Jeff Pauletti challenged his veteran team with a season-opening trip to northeastern Minnesota, home to some of the most rugged and physical Class A teams in the state. The Raiders return home with a few bumps and bruises, but an impressive two-game sweep of Virginia/Mt. 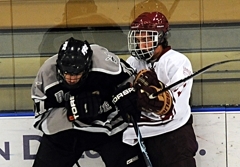 Iron-Buhl (3-0 on Friday night, Nov. 26) and Duluth Central (4-1 on Saturday afternoon) is certainly a potent salve. 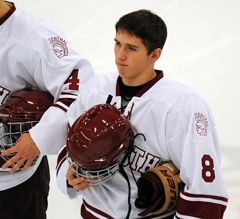 Pauletti hoped to see his team gel on the ice after just a week and a half of practice time. He knew he had talent – and good chemistry – as 17 returning letterwinners were back from last year’s 7-18-1 team. 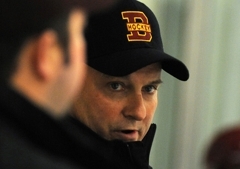 But turning that veteran talent into a successful team was what Pauletti hoped to accomplish. So far, so good. 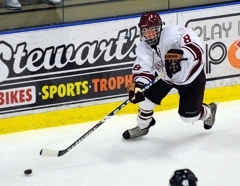 The Raiders were most impressive in their defensive zone, where they allowed two of the highest-powered Class A programs to a combined one goal. Roseville went nearly 94 minutes before finally giving up a goal to Central’s Alec Lofdahl midway through the third period of Saturday's game. That came on the heels of shutting out the Blue Devils and St. 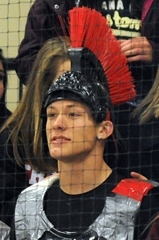 Cloud State-bound sniper Garrett Hendrickson. “It was a little defensive lapse in the third period,” said Pauletti of the lone goal his team allowed in 102 minutes of hockey this weekend. “It came off of a face off. We didn’t have guys following it. Lehr got the start in goal at Virginia and stopped all 32 shots he faced. 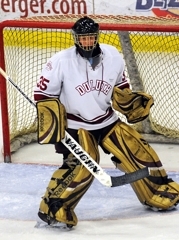 Senior Brian Comiskey received the nod against Central, saving 21 of 22 shots. Both goaltenders were rarely out of position and made the save on the first shot attempt. That was key, as the Raiders’ defense swept nearly every rebound and plugged up the slot. 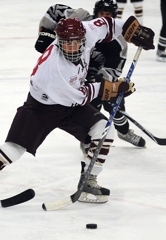 Betz anchors one of two regular defensive tandems, teaming with junior Mac Campbell. The other features junior Mark Debace and junior Austin Colvard – who tallied his first career goal Friday against Virginia. Pauletti also drops back Connor Brausen from his usual forward position when there are penalties on the regular quartet of defenders. 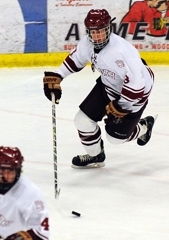 Brausen was the offensive hero Saturday, scoring two goals. A fast start isn’t new to this group of Raiders. Last year, Roseville started the year with three straight victories, outscoring Rochester Mayo, Champlin Park and Mounds View by a combined 16-4 score. But the Raiders were just 4-18-1 over the final 23 games (and were outscored 82-48). The key this winter is for the veteran squad to continue its surge into the thick of the season. “When you come out of there with no injuries, two wins, both goaltenders playing well, guys playing well offensively and defensively and getting a lot of points from across the board, I’d say (the trip) went very well,” Pauletti said. 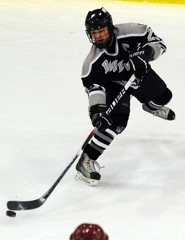 Brausen, a senior forward/defenseman, played up front for the game and scored two goals. His second-period goal gave Roseville a 2-0 lead and proved to be the game winner. Brausen also iced it with an empty-netter with 41 seconds left. Comiskey, a senior goaltender, nearly equaled teammate Nick Lehr's shutout from the night before. He stopped 21-of-22 shots, allowing only a screened power-play goal midway through the third period. Betz, a senior defenseman, gets the nod from an impressive blue line crew for the Raiders, thanks to the captain's strong play and assist. 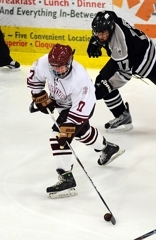 Along with Austin Colvard, Mac Campbell and Mark Debace, the Raiders' blue liners have allowed just one goal in 102 minutes of play.